Monzón, November 17, 2016. 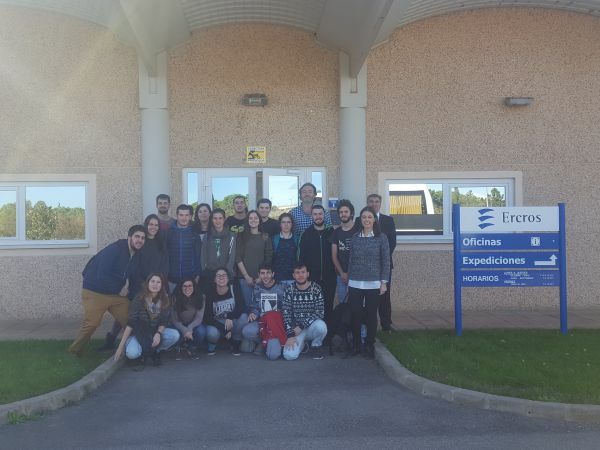 - The Ercros’ facilities in Monzón opened their doors last Friday to receive the visit of a group of students of the Degree in Environmental Sciences of the University of Zaragoza that is taught at the Higher Polytechnic School of Huesca. The visit to the facilities of Ercros is part of the program of environmental chemistry and allows students to know first-hand the operation of the PVC compounds plant and the laboratory equipment for characterization of different plastic materials. Since the students are pursuing an environmental degree, the presentation prior to the visit was about the role of the new range of materials ErcrosBio®, marketed by Ercros, to achieve a more sustainable future. These materials are based on aliphatic polyesters of natural origin (bio) and at the end of their useful life are biodegradable and / or compostable. The Monzón plant belongs to the Ercros chlorine derivatives division and focuses on the production of PVC compounds, with multiple applications: cables, waterproofing sheets, pipes, shoe soles, plugs, films and packaging. Also, the centre has approved its environmental management system, according to ISO 14001: 2004 standard; quality management system, according to ISO 9001: 2008 standard, and prevention, according to the OHSAS 18001: 2007 standard.